A truck that's compact yet capacious. 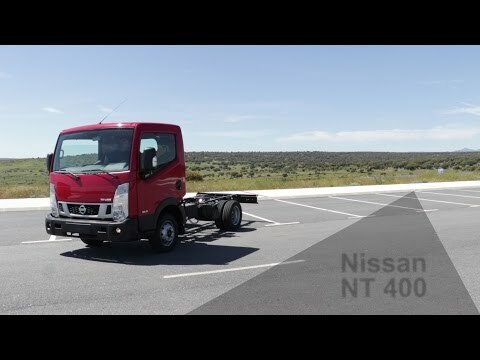 Combining maximum load space with compact overall dimensions, optimum efficiency with low ownership costs and unparalleled manoeuvrability, the Nissan NT400 is the light truck that appeals to all types of businesses from large corporates to independent enterprise. Despite its focus on practicality, the Nissan NT400 is very striking in appearance. The front grille incorporates the latest Nissan LCV identity and revised clear glass headlamp clusters while turn indicator repeaters are now integrated into the door mirrors. A new dark metallic grey is added to the colour palette replacing a light metallic blue: solid white, solid red and metallic silver remain the other colour options. Inside there are new fabrics while a heated driver's seat is available as part of a winter pack that also includes heated and electrically adjusted side mirrors and a rear heater in double cab versions. Reflecting changing habits as well as new workplace legislation, the centre console ashtray has been removed leaving behind an extra storage slot. The NT400 also comes with Nissan’s latest safety features as standard; seven technologies that work together to help keep you in control. These include vehicle dynamic control, hill start assist, lane departure warning system, traction control, ABS, electronic brakeforce distribution and electronic brake assist. All of these active safety measures are supported by effective passive features. NT400’s reinforced cabin structure is protected by a sturdy shock-absorbing front bumper, for car-like safety performance. Independent tests have shown that NT400’s safety level is equal to that of a passenger car in frontal impacts. Nissan’s trusted YD25 four-cylinder 2,488cc common rail turbo diesel unit provides the power and features a diesel particulate filter (complete with driver operated regeneration function), diesel oxidation catalyst, exhaust gas recirculation and on-board diagnostics to ensure it is fully Euro 5b+ compliant.